Heat the oil in a large skillet over medium heat. Add the onion and garlic and cook them for 3 minutes, stirring often. Add the beef and use a wooden spoon or a spatula to break it up while it cooks, until it is no longer red, about 3 minutes. Stir in 1/2 cup of the salsa, the chili powder, and the salt and pepper. Cook the mixture over low heat, stirring occasionally, for 10 minutes. 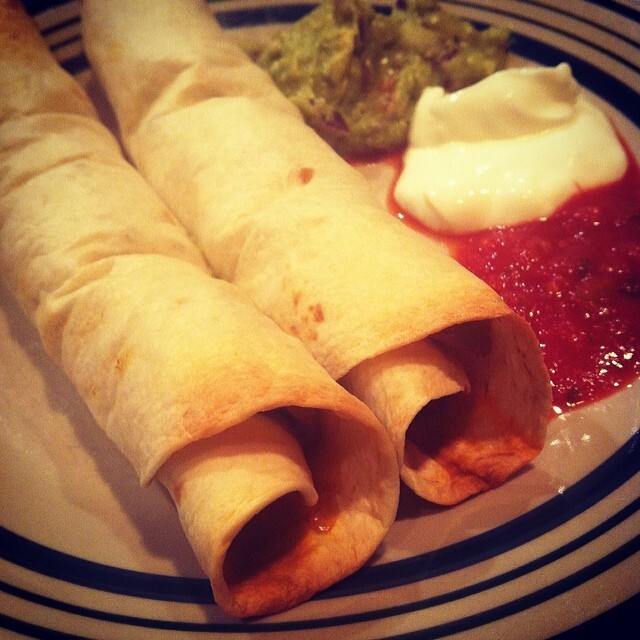 Place the tortillas on a plate and cover them with damp paper towels. Microwave them until warm and pliable, about 45 seconds. Top each tortilla with 1/4 cup of the beef mixture, spreading it to an inch from the edges. Sprinkle cheese evenly over the beef. Tightly roll the tortillas and place them on a foil-lined baking sheet with the seam sides down. Spritz the taquitos lightly with cooking spray, then bake them until the filling is heated through and the tortillas are lightly browned, about 8 to 12 minutes. I love that pinterest gives me the inspiration to be creative and make delicious dinners. This time I had a light bulb moment after seeing a meatball appetizer and an open face sandwich recipe next to one another. I crafted this little gem with a little help from allrecipes.com. 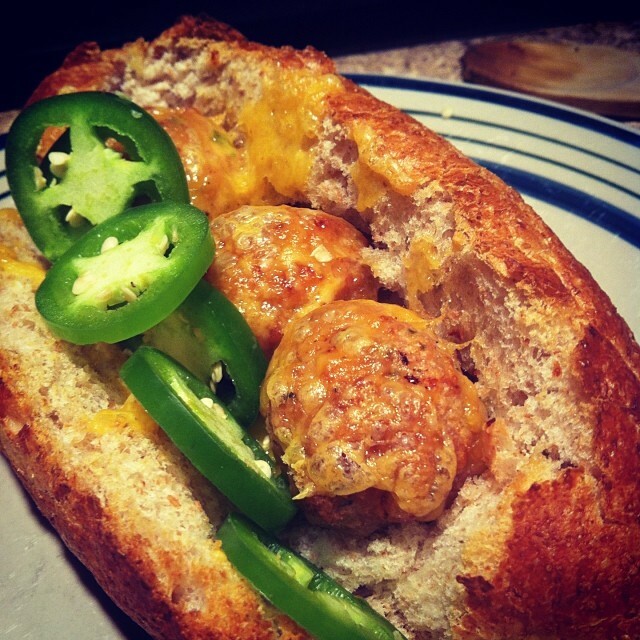 I loved the crunchy whole wheat bread with cheesy chicken meatballs. I topped mine with buffalo sauce and Perry took jalapeños on his. This recipe is a must try and I encourage trying different toppings. Spray a large baking dish or rimmed baking sheet with nonstick spray. In a large bowl combine the ground chicken with salt, pepper, egg, bread crumbs, garlic cloves, chopped jalapeño and the grated cheddar. Mix thoroughly to combine. Roll into small/med meatballs. Bake for 30 minutes or until cooked through. Slice your rolls lengthwise. 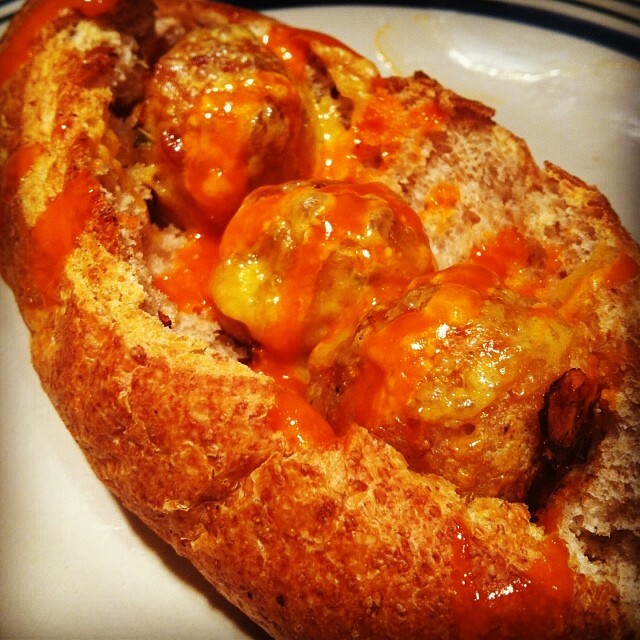 Place 3-4 meatballs in each roll, then cover with sliced cheddar. OPTIONAL: Broil to brown the cheese. I wouldn’t do this because I personally don’t like to eat burnt bread…. This was an “on the fly” recipe because we found ourselves at the grocery store short a dinner recipe. That is what is so cool about having this blog because I was able to look it up on my phone and throw something quick and delicious together. I used my “go to crust recipe” and decided I would switch up the toppings. We went Mediterranean because as of late I’ve developed an obsession with feta. The added bonus of this recipe is that we were able to get two big pizzas out of the toppings we used. Since this was a “throw together” I do not have exact measurements for the toppings but will do my best to describe what we used. In mixing bowl combine 3/4 cup of flour, sugar, yeast, and salt. Stir in the water and olive oil. Beat about 2 minutes and stir in 1/3 cup of cornmeal and the remaining 3/4 cup of flour to make the dough ball. Sprinkle a little flour on the surface you want to knead the dough on. Knead for about 5 minutes, until smooth and elastic. Cover the bowl and let it rise for 10 minutes. 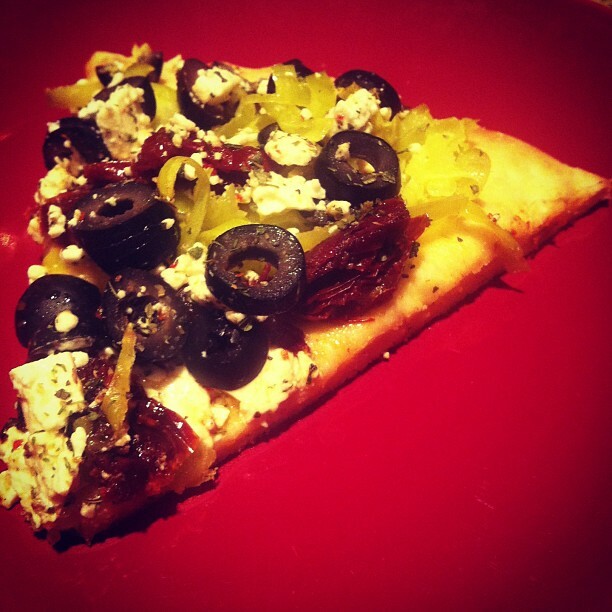 Drizzle olive oil from sun-dried tomatoes over crust. Don’t drizzle too much because it will come out super greasy and I am assuming it may make your crust a little soggy for left overs. A little does it 😉 Layer your tomatoes, olives, banana peppers, feta and any spices/herbs you desire on top of the crust and pop back into the oven for an additional 5-6 minutes until toppings heat through and cheese softens. **Recipe belongs to me but you have my permission to take it and change it and publish it on your own blog. If you post it I just ask for a little mention/credit. Sharing is caring right? 1.) 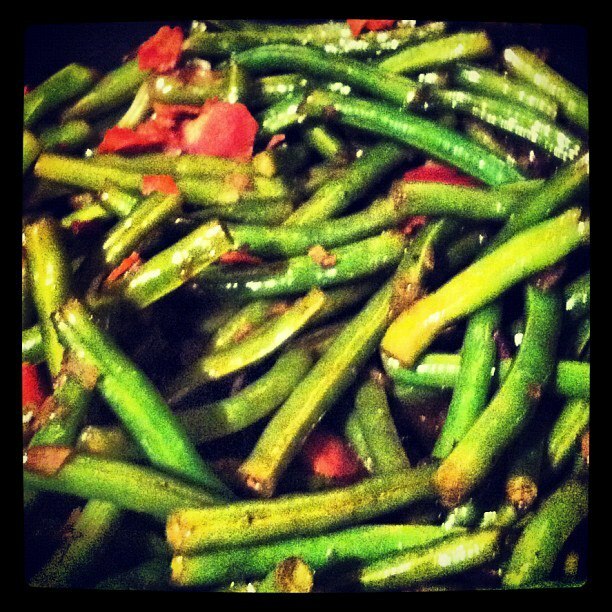 Cook the green beans in a boiling pot of salted water for 3-4 minutes (until crisp-tender) Drain and plunge beans into ice water to stop the cooking process. 2.) Cut shallots crosswise into thin slices. Separate rings. Pour oil to 1-in depth and heat over medium-high heat. Fry shallots for 1-2 minutes or until crisp. (Do this in batches not all at once. Safety first!) Remove from oil and drain shallots on paper towels. 3.) Cook vinegar and sugar in a large skillet over medium-high heat for 5-6 minutes. Stir often. 4. )Stir in butter until blended. Add the beans and saute for 5 minutes or until heated through. Season with salt and pepper.